The brown under-painting is a great help when it comes to painting the dress of the sitter. It’s much easier to continue with colors when the shape and tonal masses are done in monochrome. 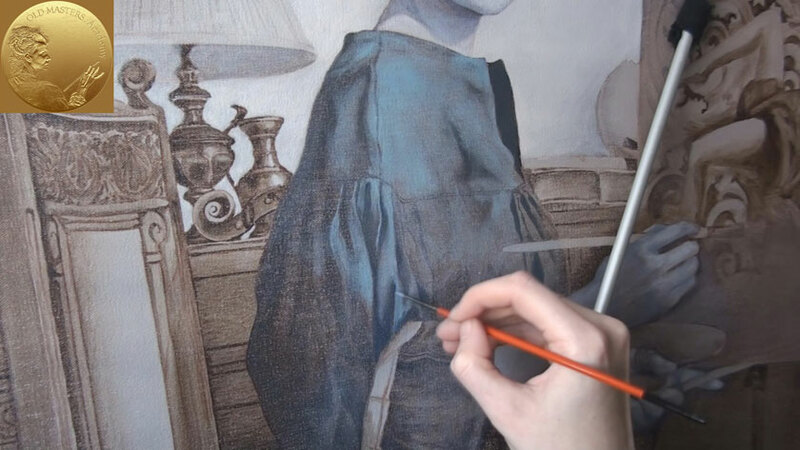 The dress can be painted using a combination of techniques, from dark to light and from light to dark. In our case we will work on deep shadows and bright highlights at the same time; leaving the mid-tones almost untouched. We can paint mid-tones with dark blue, mixing it carefully with shades and lights directly on the canvas. For the mid-tone cold color we use a mix of French Ultramarine with White and a bit of Raw Umber to make it a bit warmer. This paint mix is applied quite thinly so that the brown under-painting is slightly visible. The same color can be used for the entire dress, in combination with lighter paint for lights and darker paint for shadows and dark places. The semi-opaque cold layer is mixing optically with the warmer brown under-painting, providing an interesting effect that isn’t achievable by simply mixing the same oil paints on the palette. To speed up the process of painting, you may use different three brushes for dark, light, and mid-tones. This will help to reduce the time spent washing the brush between applications of different colors. Otherwise, you may just use a single medium-size brush and wipe it occasionally when required. You may also vary the sizes of brushes for different details or for making small or broad strokes. When painting the dress, pay attention to how its color compares with other colors on the painting. 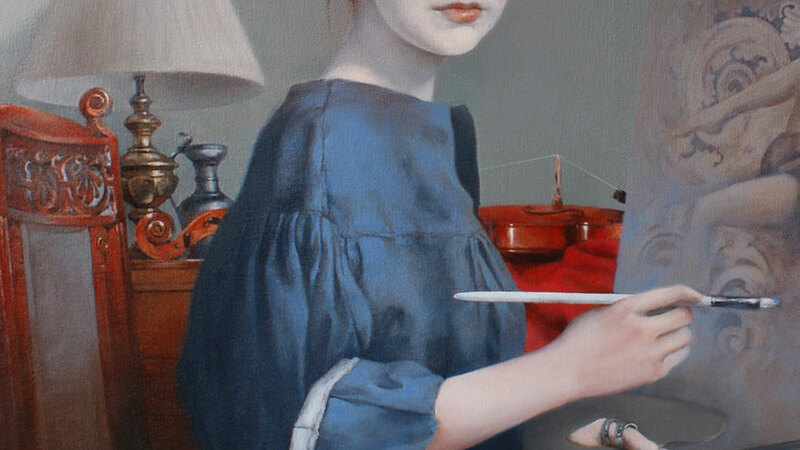 Always have a view of the whole painting rather than focusing on its small parts. The cloth dress doesn’t have strong contrasts and is, on the whole, quite dark. However, the colors in the darkest places of the dress should maintain the balance and not be darker than the darkest area on the painting. 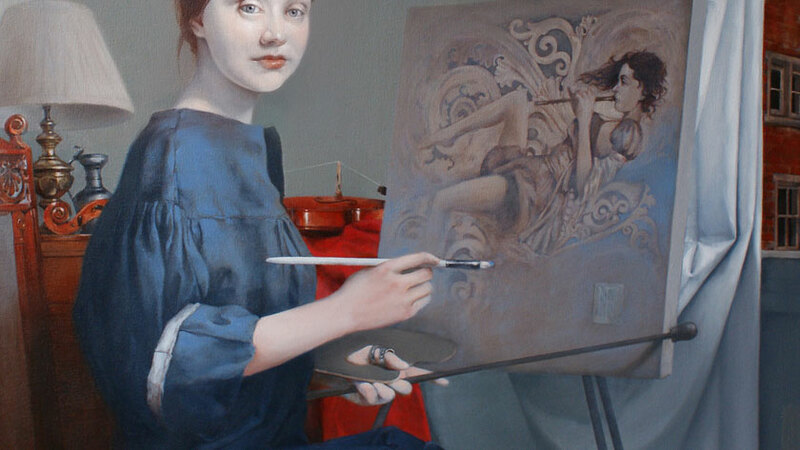 Over the fresh, semi-opaque, light blue layer, work in more details. It is a good idea to vary the thickness of the oil paint in this situation. Make it thicker in some areas and more transparent in others. While the oil paint is wet, make a smooth transition between the lights and the darker places. You can do it by mechanically mixing the two shades of paint directly on the canvas. A smooth transition will work best for the soft cloth of the dress.